This review is for a saw that I’ve been using almost daily for a little over four years now. I purchased the DW718 after using the DW708 for over nine years. Out of the box I noticed that the base had grown a bit, but still had 110 degrees of miter settings and the same simple to adjust detente plate. I found this to be a plus after witnessing what some of my peers experienced while recalibrating some of the other manufactures mitersaws. From my experience the only time I’ve had an issue with a good quality mitersaw cutting out of square is due to the operator when cutting baseboard. We sometimes get in a hurry and moving the miter handle left and right while allowing the locking mechanism to engage causing the saw to become misaligned. Another plus is the miter detente override. This comes in handy when I need a 44.5 degree miter cut. It has also been useful when “scribbling to fit” becomes necessary. The DW718 is the first mitersaw I’ve seen use a locking detent plate for the bevel adjustment. This takes the guessing out of setting up for crown mold cuts. I have only had to make an adjustment to this feature one time in four years so that’s a plus. I like the laser and easy installation, I didn’t like the nearly $100 extra I had to pay to get it or the masking tape I must put over the adjustment screws so they don’t back out while in transport. The single laser line is not an issue, having used single bevel mitersaws for years before anybody made a double bevel. I still work my stock right to left. I’ve been pretty much pleased with the accuracy of the saw and smoothness of operation. The 60 tooth blade that come with the saw was ok for general trim work but I mostly use 80 and 100 tooth sawblades. Changing the blade is no big deal. Loosen a bolt to allow the lower guard to pivot up and remove the bolt at the sawblade. The factory wrench stays in place when not in use. The factory clamp could be a tad taller at the shaft that goes into the hole behind the fence. I don’t use it much, I have developed other methods. Scrap wood seems to work the best for me. I like the 14” crosscut capacity as I tend to keep a 3/4” piece of MDF for a zero clearance fence. This eliminates tearout at the backside, keeps the little pieces from sailing out the back and ricocheting back at me, and gives me an exact point of reference for the cut. The saw does have a maximum 16” crosscut but this requires removing the fence and using a jig. The jig is easily made from a countertop kitchen sink cutout with 3/4” furring strips added to the bottom. There is some room for improvement be it minor. The first day with the saw I had to rig me a cord holder at the very back of the saw so the power cord would not get squeezed in the slide. And I didn’t like the way the motor sucked sawdust up into itself. I made a small plate along the bottom of the air inlet to keep sawdust from caking up along there. I’ve never seen a slide compound mitersaw that didn’t blow sawdust everywhere. I have overcome the dust problem but I had to make a huge hood out of FRP panel and small ga. angle metal to address it. And last, this is for every mitersaw made. When are we going to get a place at the base of the saw to plug in a light (unswitched outlet) and a vacuum ( switched outlet that comes on when you pull the trigger). On a whole I’ll Give the DeWalt 718 5 stars for accuracy,ease of operation, and value. looks like another good saw. I don’t have room to fit the arms associated with a slider. thanks for taking the time to review. I’m partial to reviews that are posted AFTER substantial use. The others are helpful to some degree, but to really know a machine, you need to use it. Thanks for posting after using it:D Reviews are easy to write when the tool is fresh and shiney and everyone wants to show off their new toy. I also have & use this saw – it is excellent. At the time I bought it @ Lowe’s it came with a free stand which costs around $200 separately. 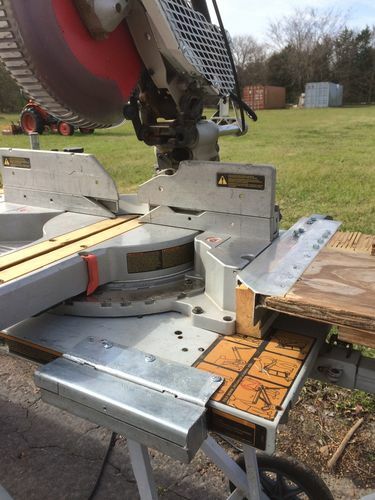 (I am sure this was built into the saw’s price somehow) All in all, a reliable workhorse. I have used it mostly in shop but have taken it to job sites as well. A great performer. -- bluesmarky..........................................."If you're here & I'm here, doesn't that make it our time?" You are right Jeremy, but get one with wheels. 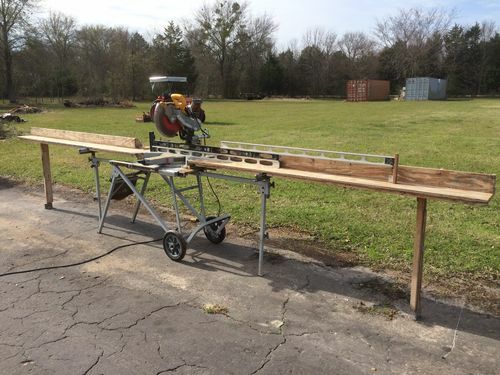 The one DeWalt makes is just a high dollar sawhorse. I purchased the Ridgid because it seemed sturdier to me and I didn’t want to be removing the saw and replacing it everytime we needed to relocate. I sometimes have employees using my tools, and at times I think they can break a bowling ball in a sandpit with a rubber hammer! I made three removable “wings” that support material to be cut. In the photos above you see the short right hand one I made so I can close the door. The one on the left and it’s mate are 8’ long made from 3/4” plywood and 1x pine. The eight footers have adjustable legs and a simple door hinge so they fold for transport. These “wings” have been in use giong on 3-4 years now. Well Darrell, that was well written and well presented. You state a fair case for obtaining a 718. Even though this an old review, I will add my 2 cents. This saw only needs 6 in. of travel to cut almost 14 in. I used the same saw for years with out any problems,a good saw. Review update. The saw is still working fine. It still works as well as it did the day I started using it. I have had to replace the motor bearings where the pulley for the belt drive is this past year. My job description has changed somewhat, I don’t do wood trim s much as I used to. Some dirt daubers had gotten into the belt drive area and after almost a year of “funny” noises, there finally was a bearing failure. Sixty dollars, and my tool repair guy had me back like new. I did change the belt drive cover to allow for easy visual inspection of the belt area. I made a new cover from expanded metal and aluminum. The new belt drive cover can been seen in the top of the photograph. The small metal box attached to the saw stand is for pencils and the fasteners for attaching the miter saw extensions.